Blimey Jon, I have 5 cowls in total and they are all flimsy. The scoop underneath is fairly solid but still not that thick! If there are thin areas in the moilding then slap on a layer or two of 1oz glass cloth before cutting. My cowl cutting method is to drill pilot holes in the corners (1.5mm works well) then join the dots with a Dremel cutting disk. Still thinking about the cowl cutting.... yes, yes I know I'll have to do it at some point, but not just yet, while I have other things to do! More progress and still avoiding the cowl cutting by finishing off the tail wheel cover. 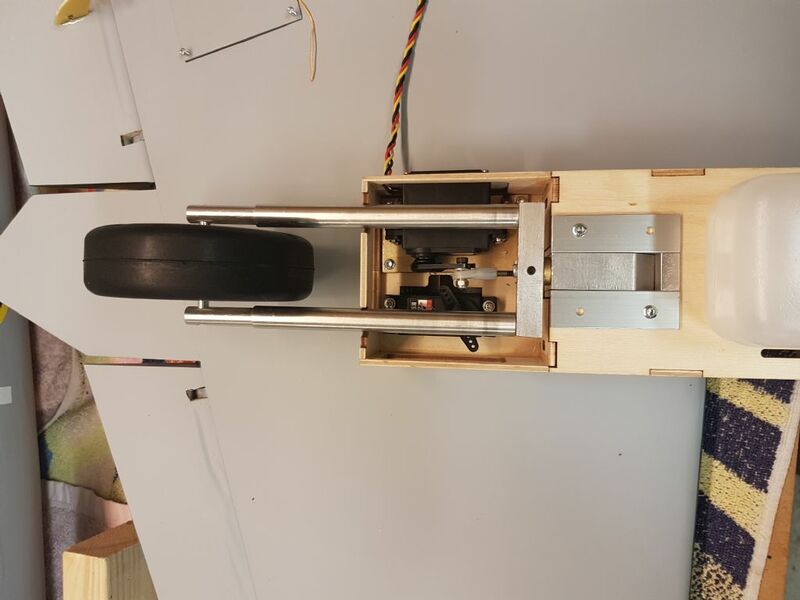 Cut with the Dremel (once I found it) and located it with four screws (can't say I like gluing access panels) and then moved my attention back to the fuselage to connect control rods. That's when I found the tail wheel would lock in one direction and very stiff in the other! I do remember someone else having this issue so it was in the back of my mind to check the full movement. So off with the cover, quick trim of the tail wheel bracket and ply/balsa hole and the nut doesn't override/lock anymore. Hi Chris, I am following this thread with interest, but could you tell me something? 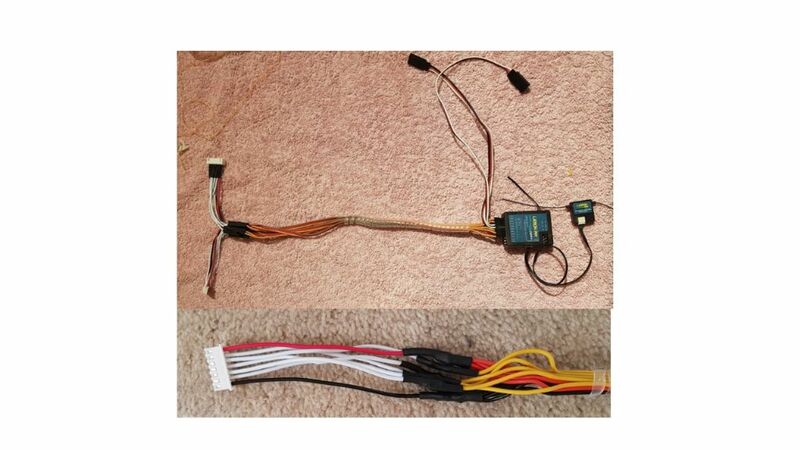 Are you planning on connecting the two servo's for the throttle and retracts via a Y harness to the RX? I have disscussed the throttle with Jon and the conclusion is that with a matched pair of Lasers and correct start up procedure it is not necessary to have them on different channels (it's the mid throttle rpm that needs to be the same) + bigger problem for me is I can't get my DX8 gen1 to do throttle cut on the aux channel, so a no no for me. My retracts are standard servos (heavy duty) and are on different channels so I can set individual end points. I have had lots of grief in the past with mach retracts so this seems the best solution. Apologies as send on my phone. PS I like to keep it as simple as possible as hopefully it's less things to go wrong. 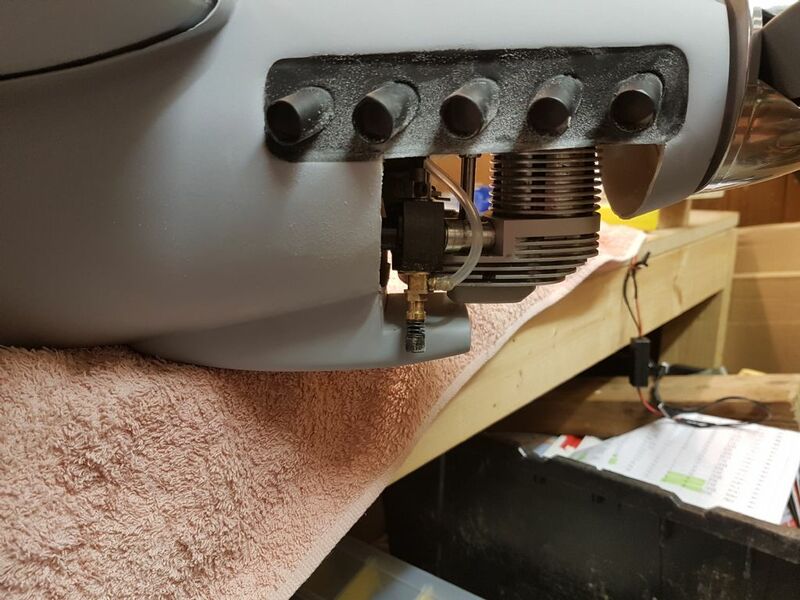 Thanks Chris, the reason I ask is that I might get on of these sometime, and interested in how the two servo's for the throttle and retracts are set up. I have looked on the link for the wiring diagram on the other page,but says page not available. hope you can post some photo's when you get to that stage. Progress... I went for Jon's option as it leaves me with a panel that can be used to infill the sides if I need to. The cowl is still ridged which brings me on to my next problem! Problem, with the cowl sitting against the LE of the wing the TE of the cowl sites up (gap) and if I push it against the wing the U/C hole closes and it seem rather stressed. if you heat the fibreglass with a heat gun you might be able to soften the resin slightly and allow a flexibility. Once the resin cools it will go hard again. Go easy with the heat to begin with until you find the spot at which is starts to go soft. 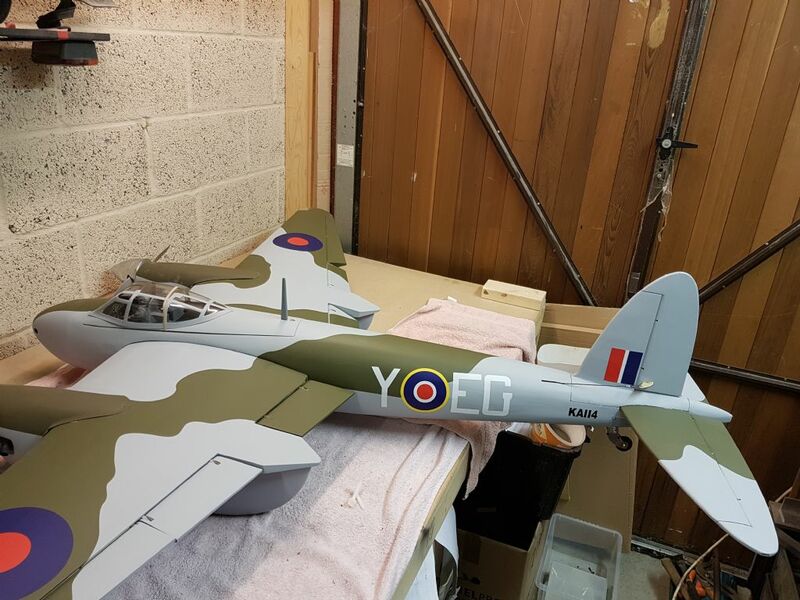 Thanks Chris got your PM, spot on, many thanks, mossie taking shape, it will be nice when finnished. Mixed news tonight on the build progress as I managed to get it together although there is more ply to add. AUW comes in at 6.9Kg so 500g heavier than the recommended range of 6.2 to 6.4 and worst to come that's C of G at 150mm back. I still have some spinner nuts to make (out of steel) and mod the internal nose to get the RX battery in. If any others could post their AUW it would be appreciated, that way I might fell better? Chris, looking on this one with interest, those Lasers fit really nicely. I am getting on well with mine at 7.8kg don't worry yet. 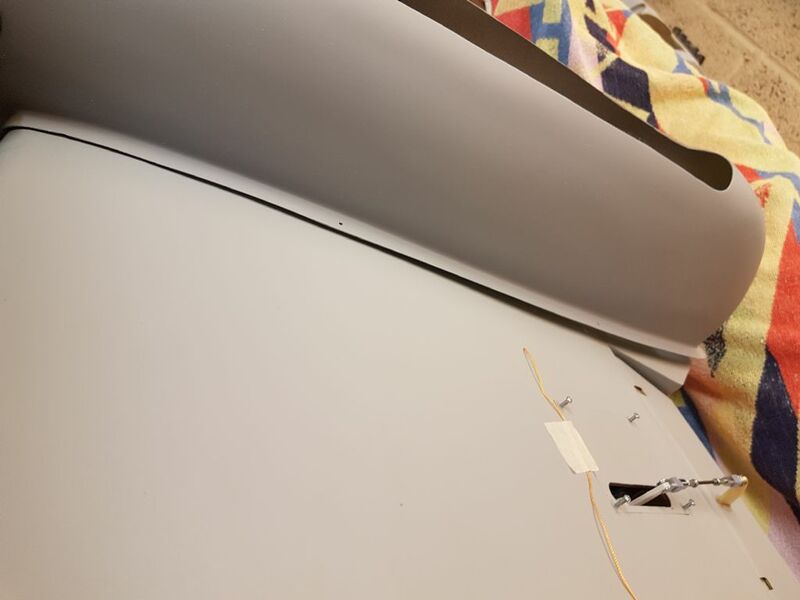 I thought about opening the front fuselage former, but in the end didn't so my ballast is behind it, so you should end up a bit lighter than me if you do. Chris a question. In the manual it says c of g 150,are you aiming for 130,is 130 the correct c of g.
Ronos, You are correct, however other owners have experience very "lively if not positively extremely difficult to control" flights at 150mm and the considered opinion suggests 130mm. There is an old saying, C of G forward flies poorly, C of G rearward only flies once. I can vouch that rearward C of G on other aircraft I have flow can be very demanding! There is a downside to forward C of G and that is the landing speed is higher, but the mossie has flaps and if the maiden goes well enough for a landing then its better than loosing it at height ! Totally agree, always better slightly nose heavy. You are thinking of changing the rear wheel, why not just put some weight on the nose or are you trying to keep the weight down? Ronos, I would have considered lead if the AUW was on target, but as its heavy it is better to see what else I can do. The problem is that very little weight that far back means I would need a big lump up front, not tried it but it could be as bad as another +300 g just to get the C of G in the right place or make a wire tail wheel. I would be less inclined if it was a retracting original as it would look nice, but at worst a wire version painted black will be less visible (at least its not as much grief as the Black Horse version!). I shall make a wire one up and see what it weighs + the change in C of G.
Anyway less waffle from me and more on progress. Wiring loom time as it looks like the RX and everything else will be well forward I am using the front set of wing/fuselage holes. And the port plug is a female and the starboard a male type so no chance of getting them wrong Just need to test everything out and the finish off the heat shrink sleeve and cable wrap. Hi Chris another question, you have moved the firewall/bulkhead back, the manual says "118mm from bulkhead to drive washer, have you taken this in consideration. ie say you moved the bulk head back 20mm,would the measurement now be 138mm from bulkhead to drive washer? I had a think about this as I got into a bit of a quandary having cut the Dual Ace one and then wondered what the offset was , but all was not lost as I had the other one to compare (and lots of checking!). 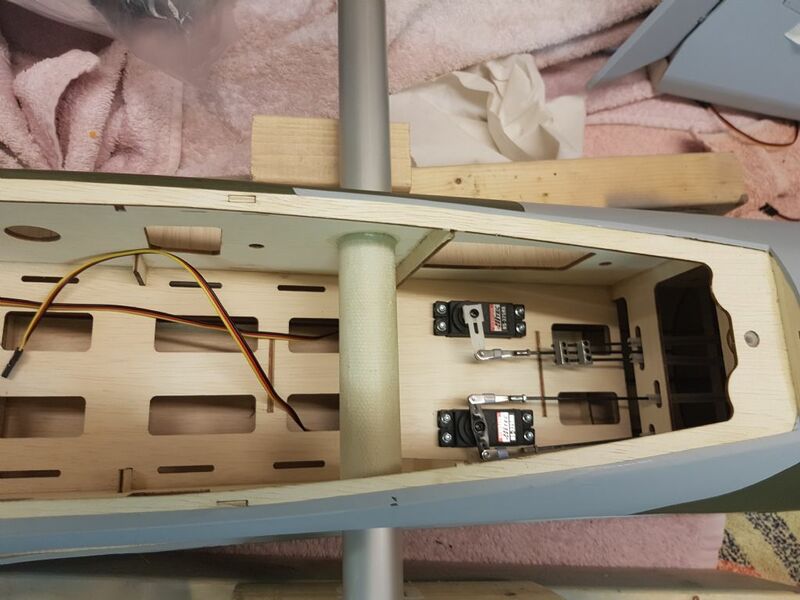 A helpful club member (thanks Martin) suggested I leave the sides so I could brace in front of the bulkhead, the reality is only a couple of small braces, but the advantage is it leaves the datum of the original bulkhead position. Hence once I came to set the drive washer position I just measure back to the sides (they are different lengths due to the off set) and hey presto all done. I am having some challenges with the cowls, but that is more to do with the poor overall fit. Bonus note, machined the spacers of the spinners and tapped the ali spinner adaptor nut. I'll see how C of G goes as I have a nice lump of brass hexagon at close to 150g that I could make a couple out of. Good idea leaving the sides to measure off. Like I said fancied on of these, and one the other day. My two AS70FS came today, call me lucky, but all I had to do to get the 118mm was to cut the piece of angle of one of the engine mounts, bang on 118mm.